E.A.R.L – a name with a very cool message electro adaptive reactive lacing! Shoes that charge and you don’t need to tie. There’s a total of 11 colorways you can buy for this shoe the og “Blue Lagoon”, “Metallic Silver”, “Pixelated Camo”, “Triple White”,and more. I really don’t care for the “Blue Lagoon” colorway honestly,the colors really don’t flow together but I can wear any white shoe for days to be honest.The details on the “Pixelated Camo” are pretty cool the lining is very detailed and precise the midsole is just a plain white to flow with it. 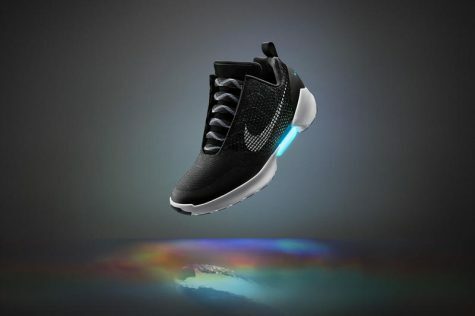 This shoe is really like the future. It’s crazy.When putting on the shoe it’ll electronically adjust the lacing and pressure to contour your foot.Once your heel hits the sensor of the shoes E.A.R.L automatically takes over and tightens to the perfect fit.After the heel lights go off the shoe starts to tighten and the shoe just does it’s thing. The shoe retails for $350 which is actually reasonable. (I mean, they charge!) There are the light up shoes everyone crazed about but these are just next level. People tend to brand themselves and only wear expensive things or stick to brands like the hypebeast themselves so there really isn’t a thing for too expensive when it comes to some people.Besides there’s plenty of other shoes that cannot even charge more expensive than this. The official slogan for the shoe has been aired stating “In the future, there are no laces” and to “Come along for the ride”! The slogans fit the shoe perfectly. Maybe there’s a chance Nike might just make some more electronic shoes.